We enjoyed our stay here. Very comfortable for watching TV, kitchen was fully equipped, bathroom was very nice, laundry area (although shared and outside) was great to have available. Master bedroom was nicely decorated but the bed seemed smaller than full size. The owners are friendly and easy to get ahold of if needed. We would definitely stay here again if we decide to visit Jax again. Highway accessibility to area attractions made driving in an unfamiliar city easy also. 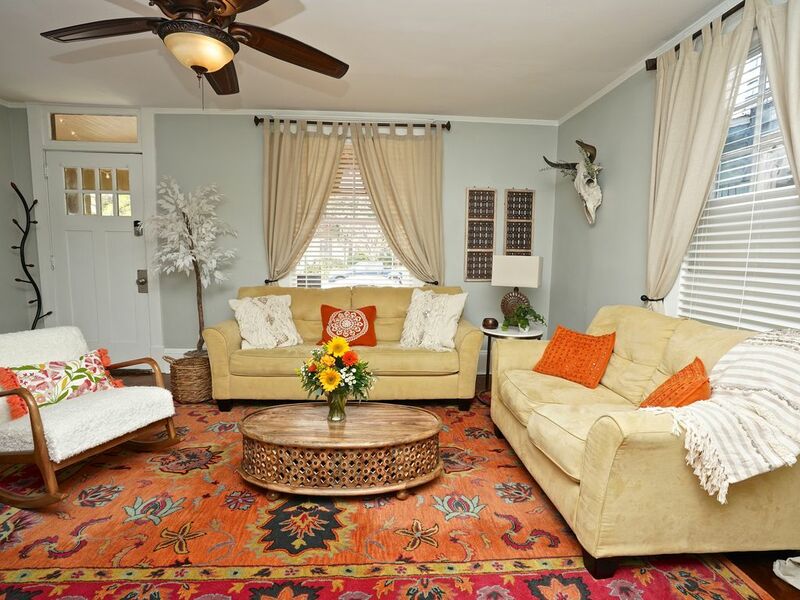 Consider booking if this owner's quirky theme of Bohemia and dinosaurs catches your eye. This chosen combo is carried out playfully throughout the Yin Yang design of this first floor, two bedroom rental. We appreciated how clean, welcoming, and efficient it is. It has an easy flow from the front living room past the bedrooms. These rooms, small but proportionately decorated, worked well for us. Young family shared the larger room with full antique bed and port-a-crib. MIL in the comfortable boho room. Apartment is sunny with well secured windows and with an option of open light or darkening curtains. The bathroom and kitchen are updated and cozy. Breakfast nook is sweet and is sized just right for 2-3 people. Would recommend high chair for toddler if necessary. The bathroom is a functional use of space in a 100 year old home. It has storage shelves & cupboards everywhere you need one. Fixtures updated, towels new and fresh, and the bonus of a jacuzzi tub with rain head fixture. Nice amenity for the end of the day but caution those unable to safely step over the side of a high tub. Use of outside washer/dryer was convenient but a little open and uncomfortable for our taste. If your taste differs you could see this a a quick way to run through a quick load if needed. Living room is open with comfortable seating with access to SmartTV. We enjoyed it as a gathering place at the end of the day. We hope you will be able to enjoy the front porch which is thoughtfully laid out to entice lounging and casual conversation. After searching several homes for a 7 night stay we chose this one for the affordable price, location, and the welcoming and creative design. We were very please with the outcome. Love this place! The house is very homey,the decor adorable. The location is fantastic, the house is very clean,the beds are comfortable,you can't get much better. The owners were around and super nice. We will absolutely stay here again on our next trip to Jacksonville. I was so happy to have you ladies! U were the perfect guests. You must know the key to my heart and that’s food and dinosaurs and u left me both!!! Thank u for the kind words we have tried to think of everything anyone would want out of a stay. Highly recommend this place if you are staying in Jacksonville. The home is located within walking distance of a few great bars and restaurants and is within a short drive to other great neighborhoods. The street the home is located on is busy on weekends, but still quiet at night. Parking on the street is easy to find even on busier nights The home itself is very charming and cozy, with all of the amenities to make yourself feel at home. The owners are usually around the property and make themselves easily available if you ever need anything. Owners are also quick to respond to messages through VRBO. Would definitely stay here again if I return to the area. we are so delighted to hear you had such a great stay! You were truly a wonderful guest. We worked really hard to make our place cozy and it’s becuase of people like you that make our business enjoyable!